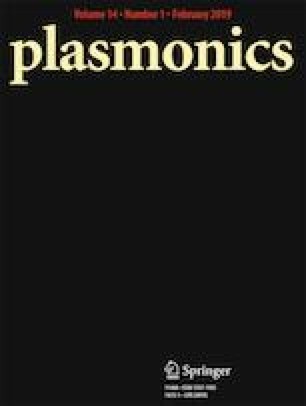 A structure of periodic metallic nanoparticle arrays is presented to form plasmonic lattice mode (PLM). In the arrays, each Ag nanosphere is on the top of a SiO2 nanopillar which sits on a quartz substrate. The simulated results show that the transmittance of the structure varies rapidly from the maximum to the minimum in a narrow wavelength range due to the coupling between localized surface plasmonic resonance of Ag nanospheres and the wavelength-dependent diffraction caused by the structure, while the phenomenon is not observed in the structure of Ag nanospheres directly sitting on the quartz substrate. The reason is that the equivalent refractive index of SiO2 nanopillar arrays is lower than that of the quartz substrate and provides a more homogeneous surrounding to Ag nanospheres. This provides a possible way to promote the application of the PLM. This work was supported by the Natural Science Foundation of Jiangsu (Grant No. BK2011033), the Primary Research & Development Plan of Jiangsu Province (Grant No. BE2016175), and the Chinese Postdoctoral Science Foundation (Grant No. 2017M621581).